Her companions add to the drama. She is the tallest of five mountainous beasts. She and her companions are flanked on both sides by steep, exposed mountain ranges that are usually snow dusted and come with big glaciers sweating ice sheets onto the valley floor. Turbo charged waterfalls bristle with snowmelt. The landscape is loud, messy and dynamic. The tourist driven whirl of scenic flights, motor boats paired with the constant click of mobile phones and cameras mimic the natural chaos. Water, water everywhere but not a drop to drink, not on the route up Mitre anyway. 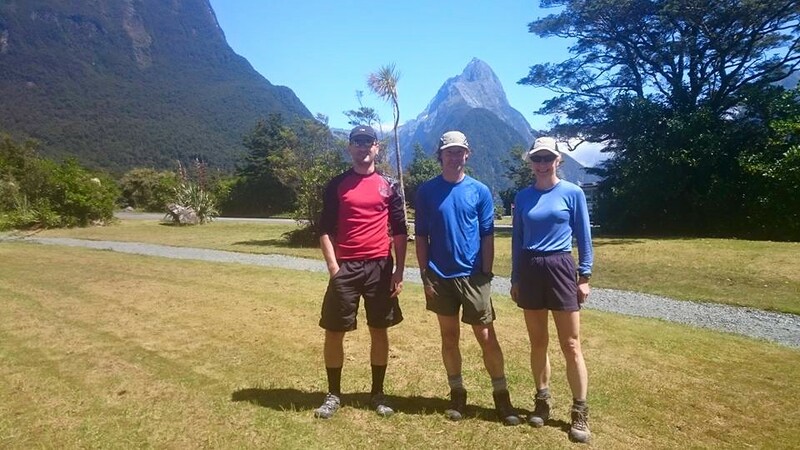 This is rare indeed for the New Zealand backcountry, ironic given we’re in Fiordland where precipitation enjoys a free, lifetime, season pass. 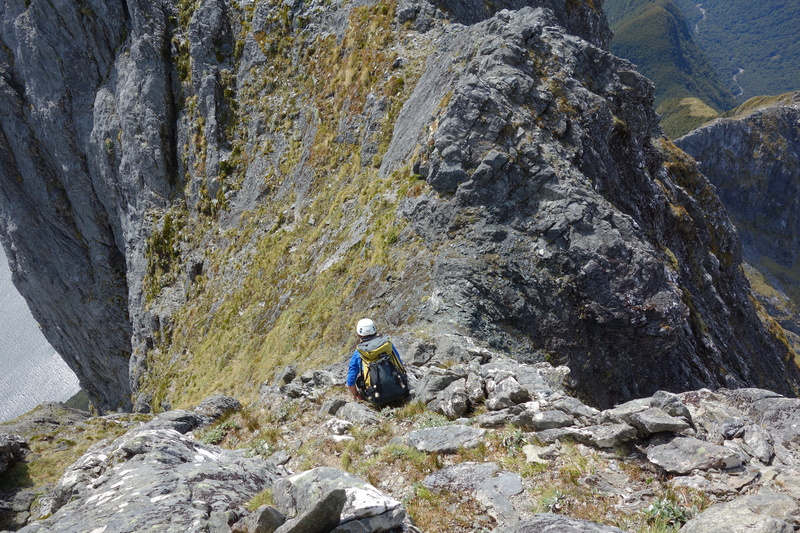 We hope to scale Mitre’s south-east ridge, alpine grade 1+. 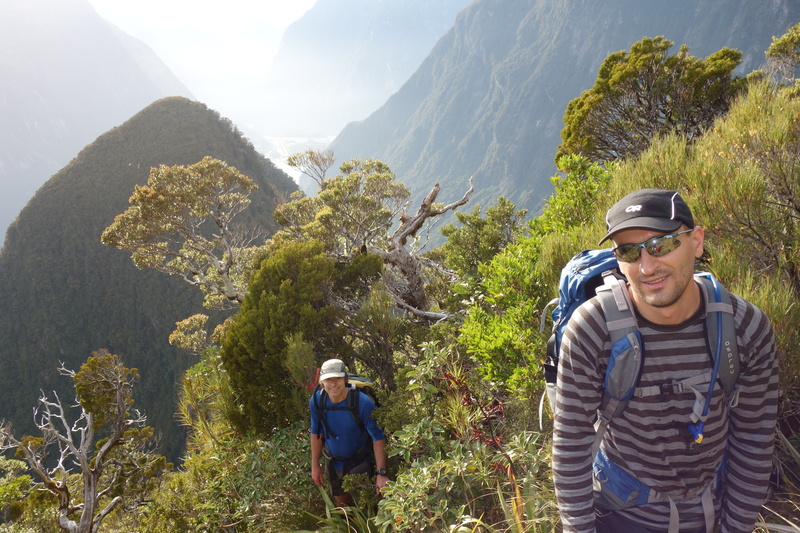 Access is via kayak or boat across the fiord to Sinbad Gully. The fiord sports a decent swell so kayaks are out. We score a boat drop off for mid-afternoon. It’s a gloriously hot and sunny day with the promise of a second one to follow. 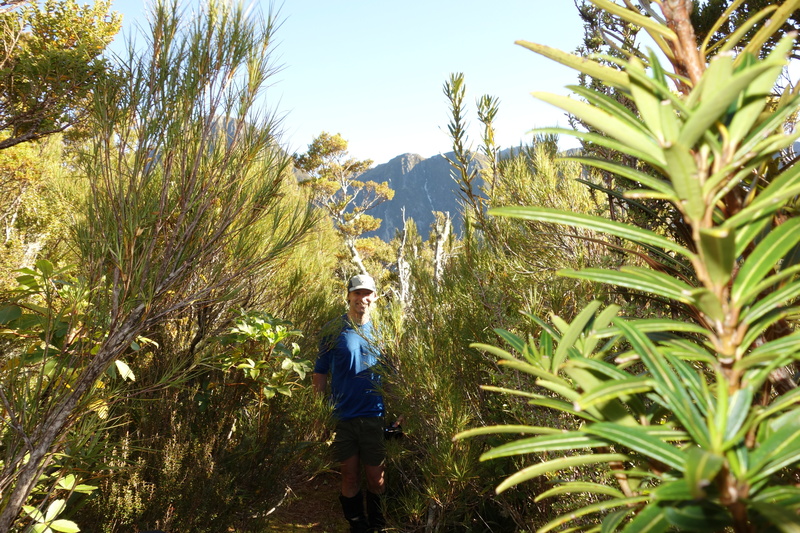 As we hustle through hoards of hungry sandflies and thick bush over to Sinbad Stream I’m glad we have Pavlo along. Not only is he our taxi driver and the one who managed to secure our water transport, as a Ukrainian he is first port of call for the ravenous hoards of sandflies. When I shoulder my pack again the change in weight is noticable. I’ve added 7 litres of water. I’m already sweating and we have yet to take one upward step. Collecting water for the climb. Mitre is only 1683m. The height is deceptive. 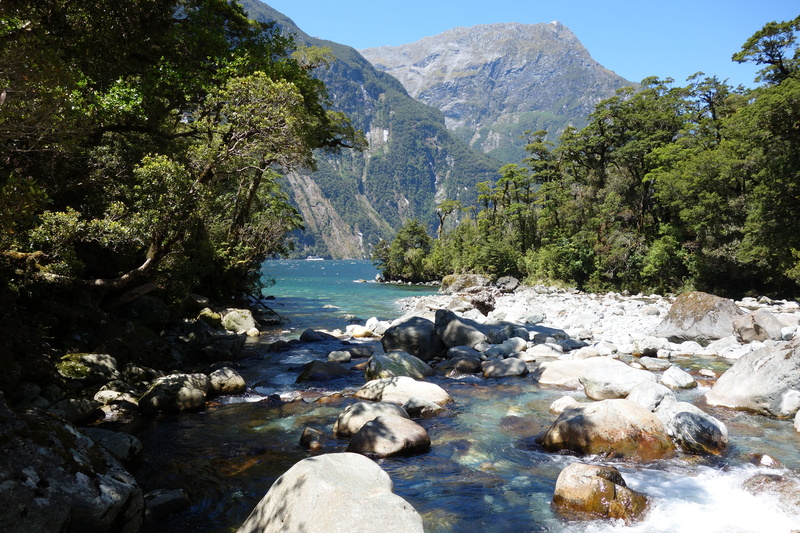 This is Fiordland rainforest at its lushest sans pedicure, manicure or Botox. There are no formed tracks here. We have come armed with some helpful route guides and good pictures. 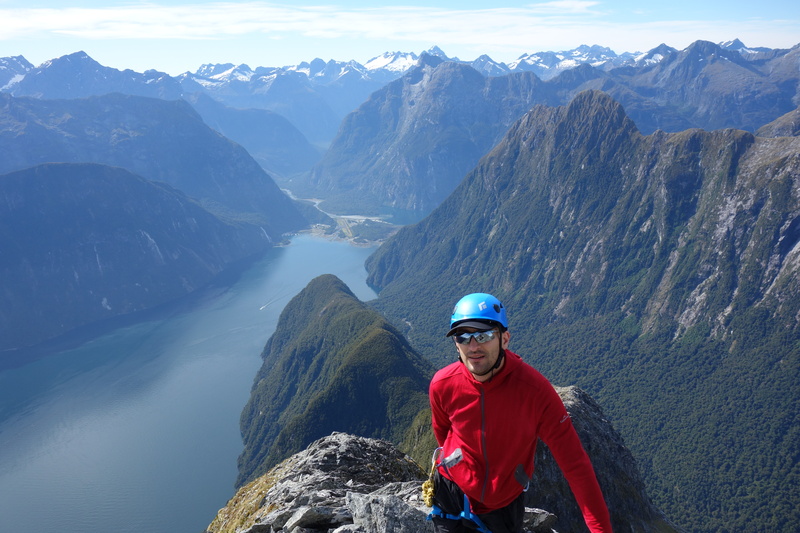 If you are keen to climb Mitre and prefer to keep your souvenir tatoos to a minimum, I recommend you wear a long-sleeved top, consider gloves and check out Danilo Hegg’s excellent blog. Not many people venture up here. Cue much seemingly aimless thrashing around as we attempt to fashion a route. For our first couple of hours the company is terrible. We make the acquaintance of far too much bush lawyer, vines, rotting trees and broken trees. Instead of sandflies we have tree branches and thorns shredding our skin. Our ears buzz with the constant hum of boat motors and aircraft. Not all the collateral damage is incurred by us. I evict a giant tree weta from its home. Numerous tree branches suffer an untimely parting from their tree mother. We have ascended 200m. Camping in between logs is not what we envisaged. The turning point comes when David spies a remnant piece of green tape that coincides with a ground trail. On high alert we soon spot orange tape as well. High fives all round. The key to the puzzle lies before us. We have located the route! Spirits soar and with it our concentration. We need to stay with the tape. Travelling at racing pace now we reach the magic point 541 where the route levels off. For the first time we can see back down to Milford township, the tiny dots of kayaks and boats out on the fiord. 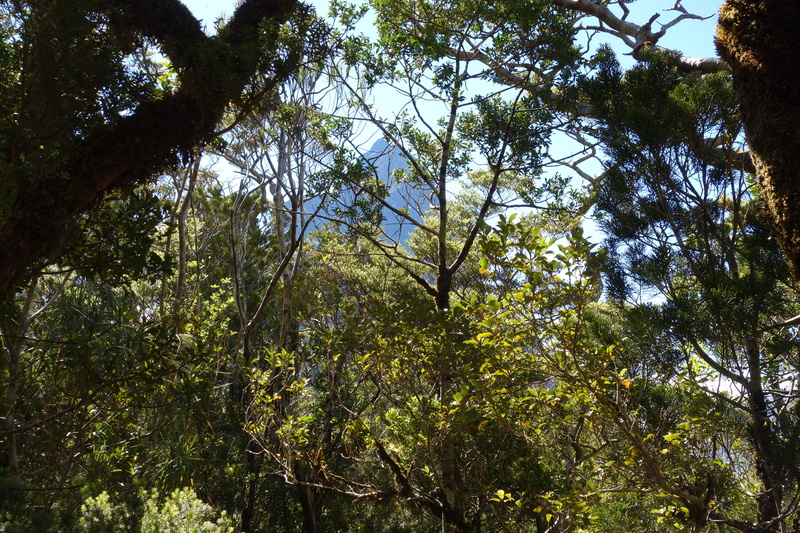 Through the thick tree curtain above we catch our first glimpse of Mitre towering above us. There are many ground trails but also well placed pieces of tape. Trail snakes and ladders ensues. We choose a trail but if we fail to spot any tape we deem the trail “snake”, backtrack and try another trail as the correct “ladder” is always marked. Three hillocks later we reach our next milestone, the Footstool 835m. After a rest we tackle the 150m descent down to the saddle. 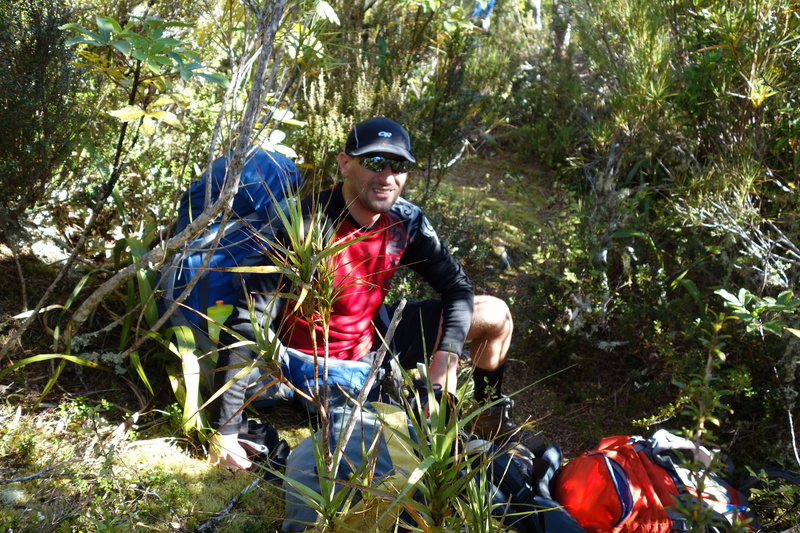 The route literally drops away, fortunately there is a cushion of thick bush, unfortunately it’s a pin cushion. Arm muscles are activated as we hang off trees. At least our legs get a rest. 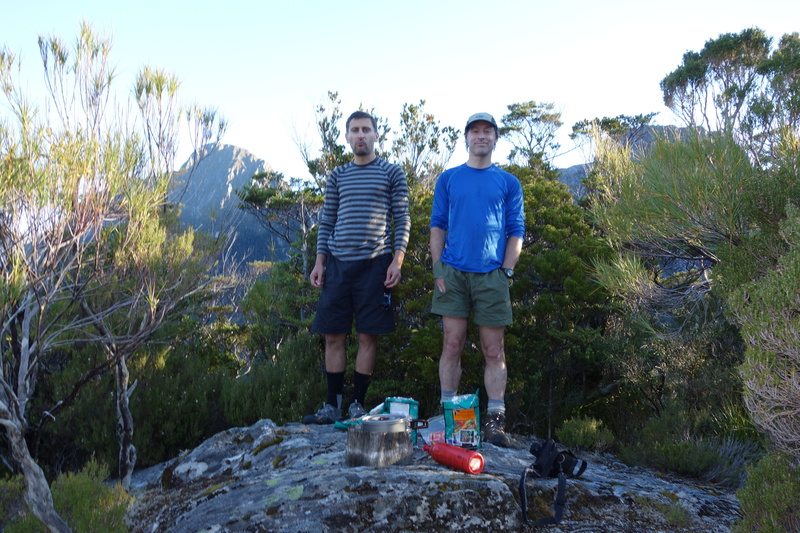 The first feasible campsites are at the saddle. It is nearly 7.30pm and time to find one. I scout ahead locating a suitable spot almost immediately. 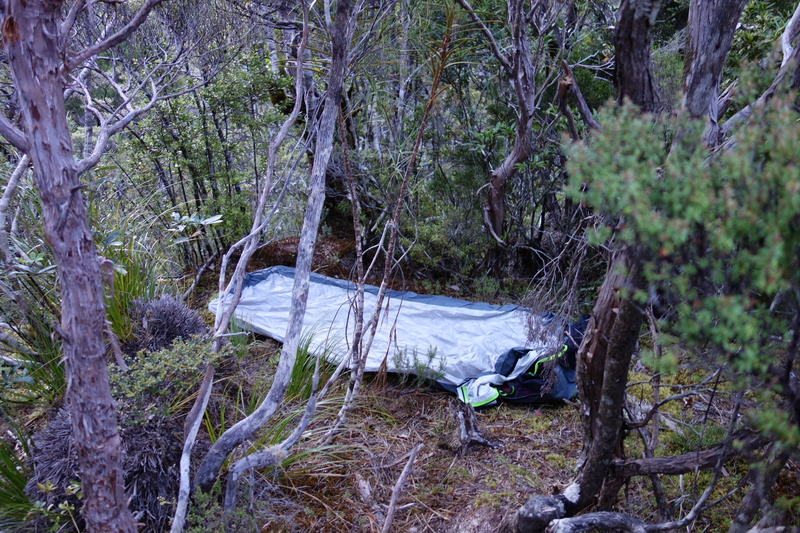 It has sufficient flat space for our three bivy bags plus a rocky vantage point with views back down to the fiord and across to the Darren Mountains. It will be good for cooking too. 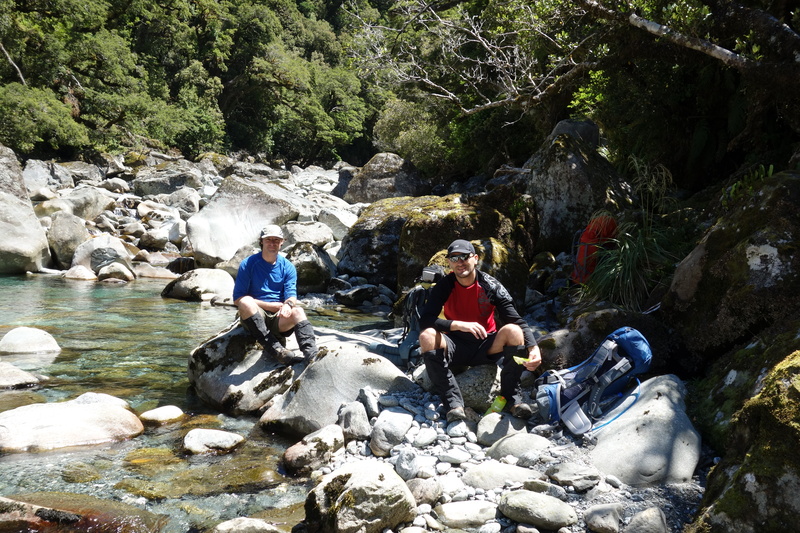 David and Pavlo take a break while I scout further on to see if there is anything better but this first spot is a winner. A bit further on there is a small puddle full of murky looking water which we decide not to drink. Someone, probably one of the savvy route marking people, has lugged a large pot up. 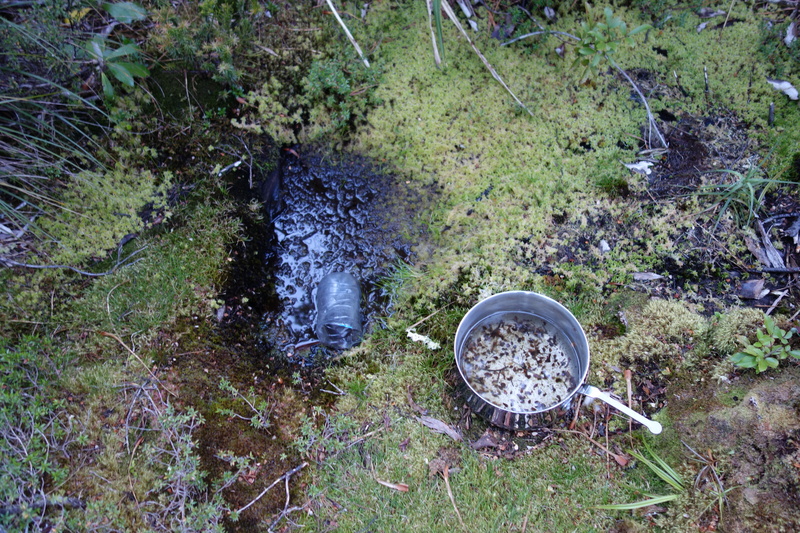 The pot is full of fresh rainwater which we use for rehydrating our dinner and our post dinner brew. The boats and aircraft have retired for the night. There is no wind. The air is still and warm. Our soundtrack for the evening is bell birds singing. We finally relax completely soaking up our magic spot. It would be possible to climb Mitre in a day but I don’t know why you would. It would mean missing a sublime evening of solitude in a special spot in far from typical conditions. We gaze across to snow coated Mt Pembroke. Robins come out to play. We sleep well on the mossy floor. During the night Pavlo the lightest sleeper gets to hear kiwi. As usual I sleep like a log and hear nothing whatsoever, not even the inevitable snoring. We rise early and pack up the gear we intend to leave at the camp for our return. It’s my turn to lead again. We ascend abruptly through dracaphyllum forest holding onto branches to pull ourselves up. There is a light dew on the ground as we pass through a few boggy sections and spot a few puddles. The water in them does not look particularly appealing. 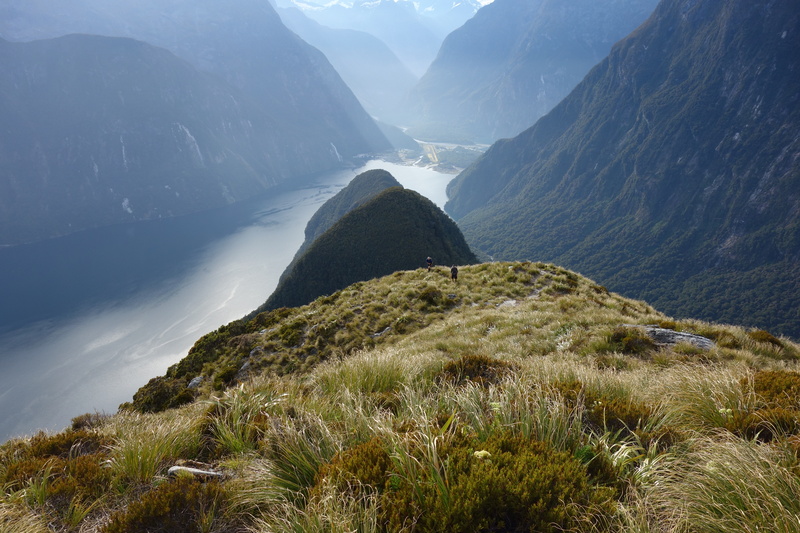 As we clear the bush line the gradient eases slightly, snowgrass slithers underfoot as views of Milford Sound open up below us. Looking back I notice that someone has placed a piece of orange tape where the track heads back into the bush. This is a good idea as it is not obvious when descending that you need to veer right rather than plunge straight down. This far above the boats and air craft we appreciate the peace and quiet that you normally take for granted when in the wilderness. Just a few robin and rock wren to keep us company and lovely alpine flowers. 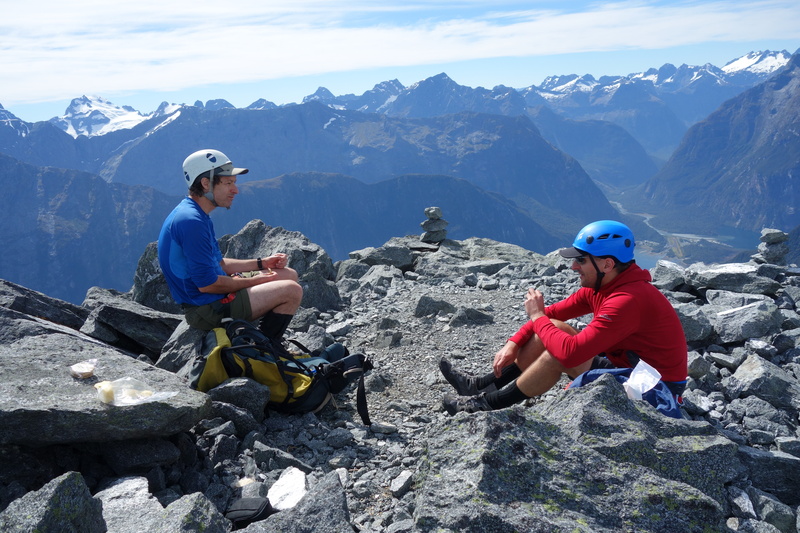 As snowgrass gives way to a rocky ridgeline Pavlo switches from tramping boots to trainers. 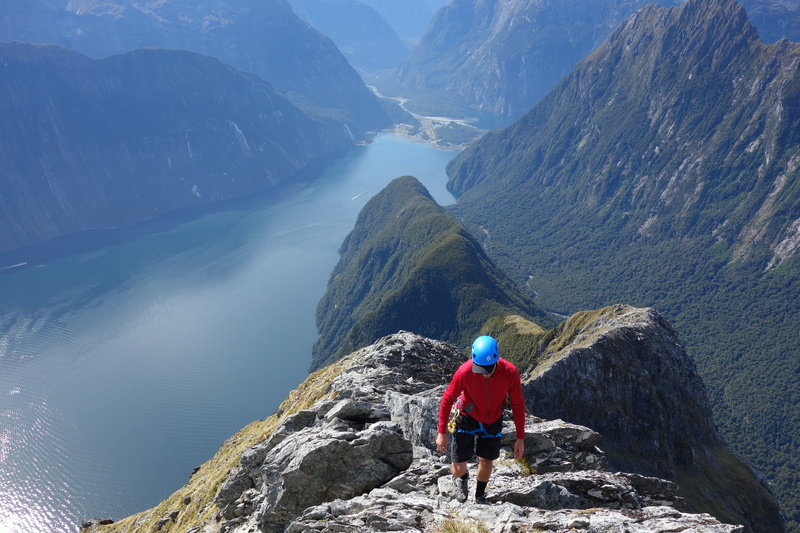 The south-east ridge of Mitre is not a difficult climb but it is possible to fall off and I’m not aware of anyone who has done so and survived. With this in mind I climb rapidly up the ridge following a faint foot trail and the occasional cairn. Stay on the ridge. Pick the safest approach. Don’t fall off. At times the ridge is narrow with steep drop offs on the right hand/Sounds side and views across to Pembroke. On the left hand, Sinbad Gully side there are impressive glaciated cliffs. Every half hour or so I wait for the others to catch up. As the ridge steepens I establish a practice of scouting ahead to identify the best route through the maze of rocks before backtracking till I have the others in line of sight so I can play traffic director pointing left or right or simply beckoning straight ahead. 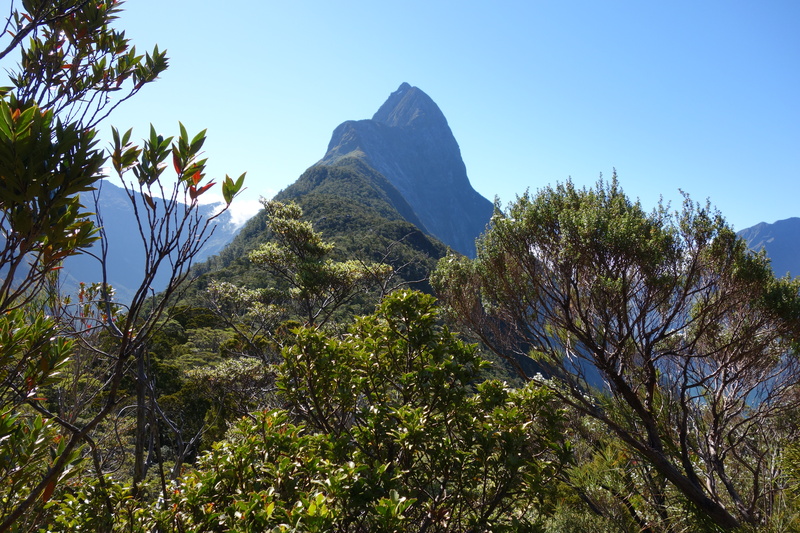 Eventually the route traverses past a knob on the exposed Sounds side and comes to a significant notch at point 1302. Time for a snack, a drink and a bit of marvelling at the scale of the landscape, the excellence of the scenery. Before us lies the exposed crux. 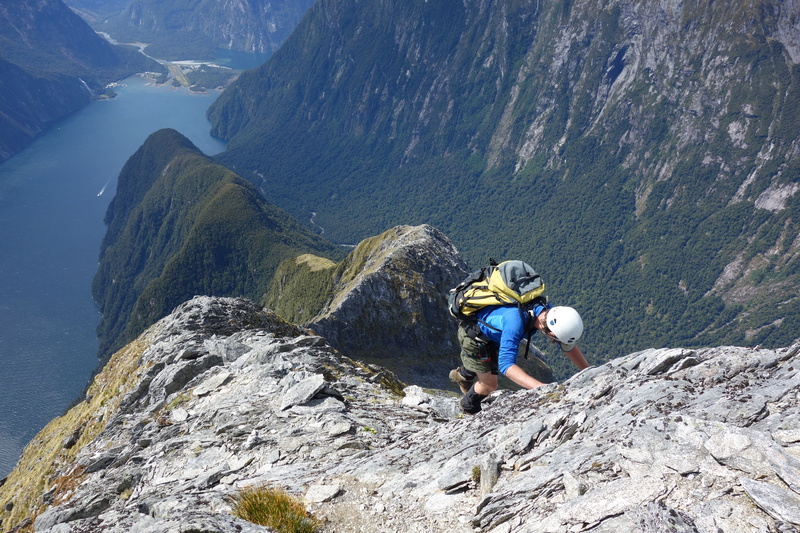 A steep descent followed by a steep ascent back onto the main ridge. This is the part of the route that is graded 10 in rock climbing terms and where some parties use a rope. We put on our harnesses, our helmets are already in place. We decide to leave the rope off for now, test the route and see how we feel. David will go first and warn us if we need to stop and regroup. David and I are wondering how Pavlo will adjust to the exposure. So far he has climbed carefully and with ease relishing every moment. As a further precaution we decide to leave his pack behind. I promise he can share my water. David descends first with Pavlo and I following. As we anticipated, for our party in these conditions the route is fine for soloing. As is often the case it looks worse than it actually is when viewed from above. At the bottom of the notch we survey the 80m steep climb ahead of us. Again it looks doable and we are mostly assessing it for ease of down climbing on the way back. David heads off with Pavlo and I in hot pursuit. We climb steadily enjoying the scrambling and the views. 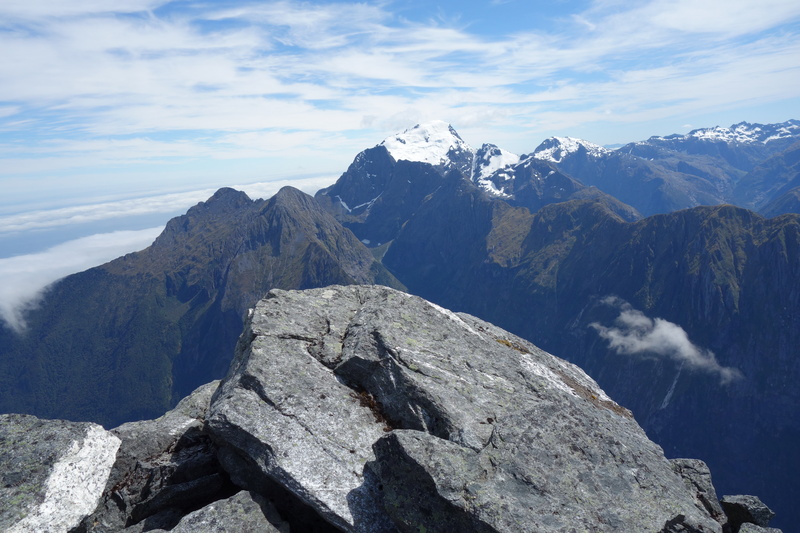 The rock is grippy and most of it stays on the ridge rather than coming off in our hands, rare by New Zealand standards and a good omen! There are a few false summits before we tackle the final down and up section which involves some random weaving through rock pillars. We pass a few key hole features – places where the rock has piled up leaving a big hole in the middle. Looking glasses with a confronting view straight down for at least 1000m. 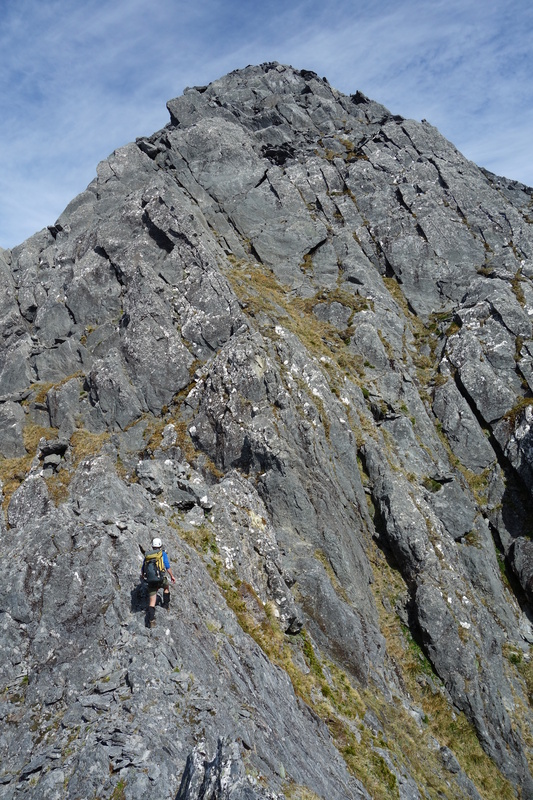 At 12.30pm we are standing on the spectacular summit just us and a few cairns and views of the sounds and mountains. It has been a fantastic climb offering us a unique perspective on a much photographed mountain. I guess the view is similar to what you see if you take a scenic flight but the experience of climbing up to the top yourself is different. 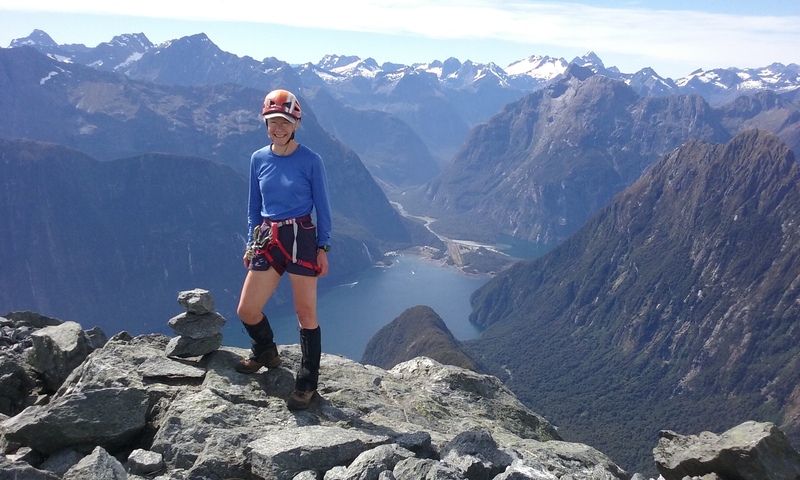 For me climbing is about exploring personal boundaries and collaborative team work. Getting to the top is important but how we get there is just as important. I’m always prepared to walk away without reaching the highest point if anyone in the team is not feeling sufficiently comfortable. We all came knowing that summiting was a real possibility but not guaranteed. We are stoked to have made it all the way but the top is a small part of the experience. “Ukrainian first ascent?” I ask Pavlo as we stand around grinning. Cheese, crackers and chocolate never tasted better. After savouring the moment we discuss the descent. 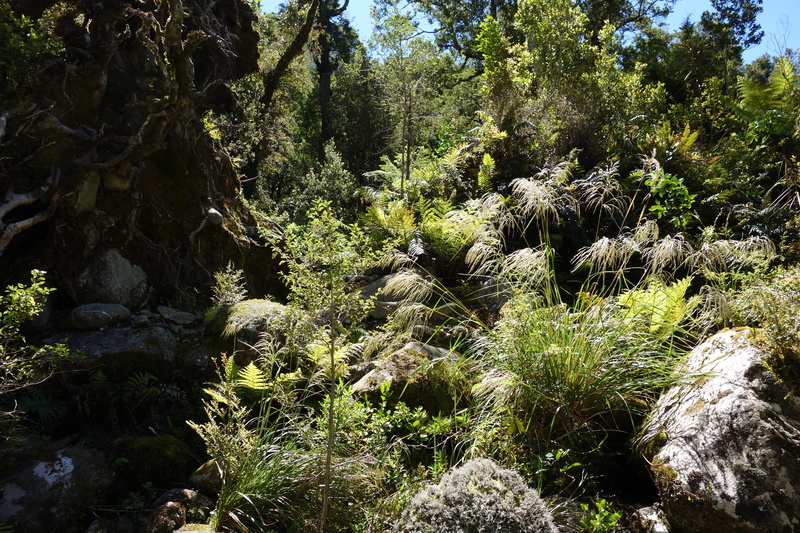 We are concerned about two things, down climbing the crux of the route and the final bush bashing section. The rock descent goes smoothly as we are well in the scrambling groove by now. It is harder to pick the route from above but we manage to locate the best way and to remember key pieces of rock that we passed on the way up. Back at the notch we gather Pavlo’s pack and spot a group of three on the horizon. David heads off to speak with them while Pavlo and I follow carefully retracing our steps. The climbers started this morning and hope to summit and return to their kayaks today. They are making good time speeding along in their trainers and it seems likely that although the will be returning across the fiord in the dark they will make it. Descending the rocky ridge then snowgrass to the bushline turns out to be the easiest part of a long afternoon dropping height. 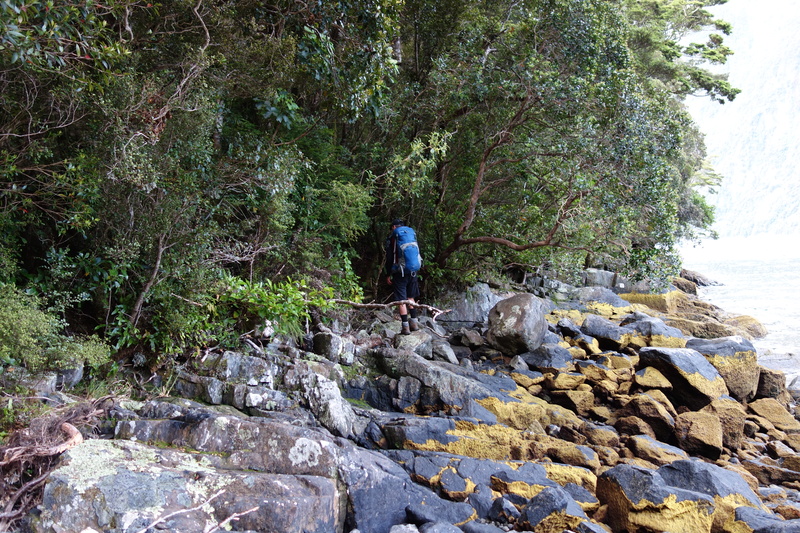 Reversing the route through the dracaphyllum forest through which we accessed the bushline is mind blowing. David makes short work of it while Pavlo and I curse and crash as we hang off tree branches scrabbling around in search of solid ground. By now we are starting the feel the effects of the heat, it must be at least 30 degrees and coming from Wellington we aren’t used to it. It’s a relief to drop to the saddle and pause to pack our gear. I divvy up the remaining water and lace it with the remaining electrolytes. We attack the peppermint chocolate keen for a quick energy hit. The dracaphyllum has claimed my sunglasses but not my sunhat. We count off the landmarks as we retrace our steps. Each milestone is etched on our brains from the concerted effort we put into sticking on the route on the way up. Back up the notch to the flat part of the trail. 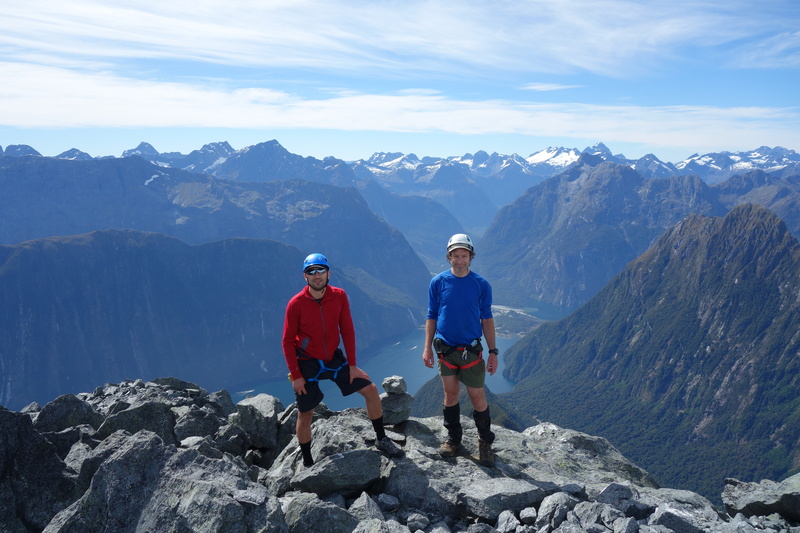 Time to enjoy our last great views down to Milford then it’s back to route finding as we pick our way across and down. It is slow work but we want to stick with the route so there is no point in hurrying. Inevitably we still manage to lose our trail with about 350m of descent to go. By now David who is leading, is keen just to just do it and opts for crash and burn approach. This results in us exploring a route different to our ascent but in many ways preferrable. Ferns and rotting logs provide unexpected falls but softer landings. The afternoon’s turning point comes when we see Sinbad stream far below us, more high fives. 6.30pm sees us land safely in sandfly city. The tide is out, the sun is setting and our boat is on its way. David and I ignore the sandflies and don our life jackets for the trip back to Milford. Pavlo is quick to apply repellant though so they come looking for some Kiwi flesh. I ask our boat driver whether he thinks we can claim a Ukrainian first ascent. He is sceptical. “Ukraine is not known for its climbers is it?” He asks. “It is now” I reply grinning at Pavlo. Well played gents! I was up there a few wees ago – didn’t make the summit though. I bet the view over the other side is epic!